Missouri, torn by divided loyalties between supporting the North or the South, had 39 infantry regiments serving in the Union army. Of these, the 15th Missouri, comprised primarily of German immigrants, served the longest and suffered the highest percentage of battlefield casualties of all the Union regiments from Missouri. Yet very little source material is available about the 15th Missouri. German immigrants seldom wrote of their wartime experiences, and those who did wrote almost exclusively in German. A veteran of the regiment, Maurice Marcoot wrote the only known firsthand account of the 15th. Written years after the war, Marcoot’s detailed chronicle of life in the 15th Missouri is the framework of Long Road to Liberty. Also using letters and diaries of Germans with other regiments, author Donald Allendorf expands on the experiences of the immigrant-soldiers—how they felt about slavery and race and why they chose to fight. 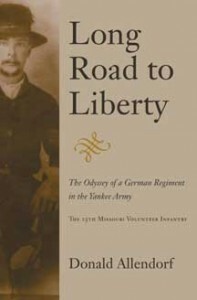 Long Road to Liberty traces the men’s immigrant roots and their involvement in events leading up to the war, including breaking up the last slave auction in St. Louis and efforts to keep Missouri in the Union, and continues with their army lives as the state’s first volunteers. It details the 15th’s actions in crucial battles in Tennessee and Georgia: their desperate stand at Stones River and near annihilation at Chickamauga; their charge without orders up Missionary Ridge; the campaign for Atlanta; and their role at Spring Hill and the killing field a day later at Franklin, Tennessee. They served almost five years, most of that time in daily contact with their Southern adversaries in Tennessee and Georgia. When the war was finally over, more than half of the 904 officers and men who had ever served with the 15th regiment had been wounded or killed, while another 107 died of disease. Historians and Civil War buff s alike will find Long Road to Liberty a welcome addition to the literature of the war in the western theater. Donald Allendorf, a journalism graduate of the University of Missouri, spent 40 years in communications and journalism and was the director of marketing communications and research at the Gates Corporation in Denver. He now lives in Colorado and Missouri.